A configurable status bar to provide you with your current hot item counts and quotas. A convenient control of whether you are allowed to kill NPCs or not - and an icon to display at a glance which mode you are in. The total value of fence-able items you're carrying. The number of fence-able items you're carrying and the remainder of sells for the day. The number of launder-able items you're carrying and the remainder of launders for the day. The average value of the fence-able items (off by default). The estimated session's income you'll get if you fence items of like value up to your per-day limit. A graph of your fence-able items' quality. These counts can be configured according to your preferences by setting filters for certain categories of stolen items. can be set for particular destinations: Fence, Launder, Ignore (does not count towards either), or Junk . Any other items that don't belong to any of these categories are automatically considered for fencing. Only items considered for fencing will be counted in the fence-able items, the total value of currently held items, the average value, and the quality displays. Only items considered for laundering will be counted in the launder-able items. Ignored items will not be counted by anything except the recipe, motif, or furnishing counts that you can see in the chat window. You can also set it to ignore all stolen items that you have marked as junk in your inventory. Finally, you have the option of saying that if an item would normally be considered for fencing, you can still have it ignored if the value of the item is less that a threshold value that you set. If the threshold value is zero, then none of the worthless fence-ables will be ignored by this. Thief Tools now provides an auto-stealing "mode" which sets it so that you have auto-looting of stolen items turned on when you are sneaking and undetected. If you stop sneaking, auto-looting of stolen items is turned off. If you are sneaking and detected (in enough time for the addon to notice before ESO opens the container), auto-looting of stolen items is turned off. It is still possible to be caught stealing - because they saw you after the container started to open - but this does offer you just a little bit more protection. The protection against detection is less effective when you are pickpocketing - just be careful! The coin bag icon in the status bar will appear if you have the auto-stealing capability turned on (and if you turned on the icon!). 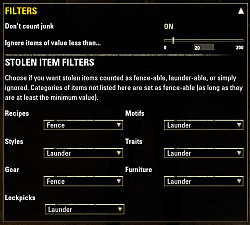 In addition to simply ignoring junked items, Thief Tools can now automatically put items into Junk for you. Rare ingredients and food additives such as flour and decorative wax will not be auto-junked even if you have set ingredients to "Junk"
Any item at or above a certain (configurable) level of quality cannot be auto-junked no matter what you set the category that item belongs to - the default level is currently "Legendary". The auto-junker only works on stolen items. Your other addons can handle junking of non-stolen items. Really, it makes sense to have separate rules for stolen verses non-stolen items anyway. You would not want to junk soul gems - unless they were stolen soul gems that are only worth 30 gold - one of your limited number of fence slots should be saved for something worth a lot more than that! And laundering them for 30 gold, when you might get them from guild traders for less - or in Cyrodiil for free (Rewards for the Worthy) - that doesn't really make sense either. Also, auto-junking is temporarily turned off while you are looking at your inventory - that way you can unmark junked items before destroying or selling what's left without worrying about having the item automatically re-junked while you are working there. It is automatically returned to its previous setting when the inventory window closes. You will see messages about this in your chat window each time it occurs. This very simple capability provides two ways of turning on or off the Prevent Kill mode provided by the game, and an optional icon on the status bar when you are in "Kill Everyone" mode. Use the /tt.tm or /tt.safe command in the chat window (they are identical commands - I wanted the /tt.tm because I was used to using the TroubleMaker addon). If you prefer to use a different addon such as TroubleMaker, Thief Tools will happily co-exist with it. Thief Tools will still detect when the Kill Innocents game setting changes either by other addons or by game settings and display the red hand icon as appropriate. /thieftools - Display all of the chat commands for ThiefTools with a brief description of what they do. 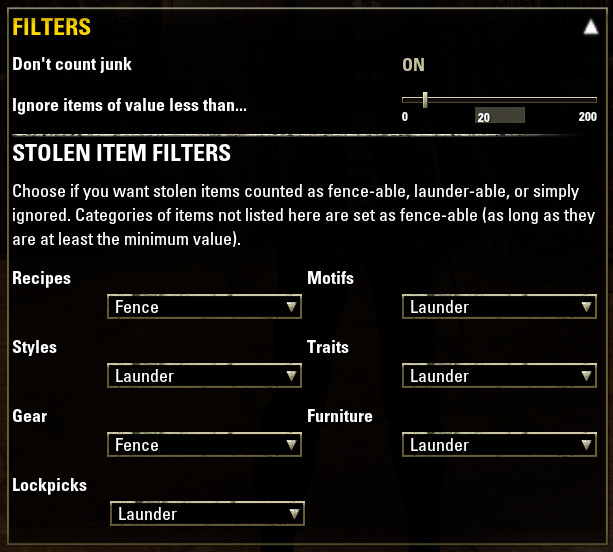 /tt.counts - Display all of the counts for what you have in your pack - the recipe, motif, and furnishings counts (these are counted in these special counts even if they are otherwise ignored due to other filter settings), and the fence and launder counts. /tt.fencetime - Fence Reset Timer. According to Elmseeker (Thieves Knapsack Extended), it appears this is a fixed time (3am UTC). This addon owes its inspiration to Elmseeker's Thieves Knapsack Extended addon - who heavily influenced my UI choices since I really liked the UI that it provided and wanted most of it back. As this is my very first addon, I also wish to acknowledge the ESOUI Wiki, the tutorials there, the Thieves Knapsack Extended addon, and the Roam Home addon which I read to discover how some things worked. Updated /thieftools help command to use the new utilities from LibSFUtils. Change to use standalone libraries (LibSFUtils, and LibAddonMenu) instead of bundling the libraries with ThiefTools. This basically removes the addon overhead (and functionality!) for the current character on an adhoc basis without having to /reloadui to unload or load the addon. By doing a /tt.stop you tell ThiefTools to essentially disable itself - no further ThiefTools background processing can happen. By doing a /tt.start, you tell ThiefTools to re-hook itself into the game in order to receive event notifications to to perform its automatic stolen inventory and loot processing and restore the toolbar if you have it set to be visible. If there is a problem, reloading the ui will reset ThiefTools back to "started". Reverted the "[TT]hFence sells left: " prompt fix that didn't work out. Possibly fixed the "[TT]hFence sells left: " prompt that was occasionally seen. (reported by AgnarUrthadar) (Fix suggested by wyzzard2k). Add the ability to decide how stolen jewelry should be handled. Setting it to "Ignore" will prevent it from counting towards your fence totals and will prevent it from being auto-junked. Created a new slash command for ThiefTools - /tt.resetbar - which will move the bar to the top left of the screen and set it to be visible (and moveable). This can be used for those occasions that the ThiefTools status bar has inexplicably disappeared to make it visible again. 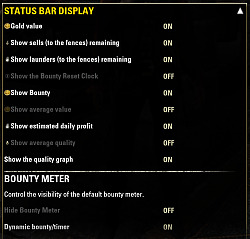 Also, the ESO standard Infamy (Bounty) meter will be set to hidden (the default). Removed some debug printouts that were mistakenly left in chat. Fixed error where minimum quality to save was set to "Mode_Legendary" instead of 5. Still looking at other reported errors. Fixed error reported by joshmiller83. Changed to ZO_SavedVarsNewCharacterId() in order to properly handle toon name changes with saved variables. Updated LibSFUtils to version 7. Updated LibSFUtils to version 6. Updated LibAddonMenu 2.0 to r25. The status belt will automatically hide itself when you go into the Battlegrounds and restore itself to its previous setting when you leave those areas. Fixed the Bounty Timer so that it counts down again. The status belt will automatically hide itself when you go into Cyrodiil or Imperial City and restore itself to its previous setting when you leave those areas. (It probably works the same with the Battlegrounds but I have not tested that yet.) It is not really needed in those areas as there are no guards and nothing to steal there - and you have more pressing concerns anyway, like hostile players, to worry about. Modified the settings saves so that it distinguishes which megaserver you are currently on. This change will require everyone to redo their settings to save them for the megaserver(s) that they play on, but it allows people to play on multiple megaservers without getting the savedvariables corrupted. Note: Some people have mentioned that autostealing gets turned off due to the settings reset. In order to turn it back on, you can use the /tt.as command in the chat window which will toggle autostealing between off and on. If you destroy a stolen item, the gold value for fenceable items is reduced. Note: Further investigation of two known problems: max number of fences not increasing when you put a skill point in Trafficer passive, and the fences left counts not resetting when the fence resets daily are both traceable back to the fact that Zenimax does not update the counters that this addon references until you visit a fence. While I could potentially track when the passive increases and fix that, it would unnecessarily add load to the game for the sake of catching something that happens oh 4-5 times in the life of the character. Also, I can't realistically fix the fenced items count not resetting properly without potentially making the game slower (all that periodic checking just to see if it is reset time yet) - It's just not worth it when all you have to do is to visit a fence. Change the addon version number in display. Toggle auto-junk message fixed. Before, when you toggled it on it would say that it was turned off and vice versa. Now it announces the correct state. All chat messages that come from ThiefTools are now tagged with "[ThiefTools] " in the chat window. Revised bounty time calculator to make more accurate estimates. Stolen containers will be ignored. The setting of auto-junking on or off with /tt.junk is now remembered between sessions (logins and reloads). The display of launders/launders left was not always working properly. Fixed. The display of fences/fences left did not update when you put in the skill point to upgrade it. Should be fixed, but I don't have a character I can test it with anymore. The category "Trash" is no longer an auto-junked item as it sometimes is applied to something you might want to fence. Recipes were not separating into provisioning and furnishing recipe categories. Fixed. The temporary auto-junking disabled and re-enabled messages in chat - they were always a temporary measure which would be removed after I had the chance to test with the new Horns of the Reach DLC. They have served their purpose and have now been removed. Fixed problem with not being able to turn on auto-stealing mode after turning it off. Removed debug messages from chat (sorry). The temporarily disabling and reenabling auto-junking messages are not displayed if auto-junking has been disabled. Fixed the lua errors being reported from the junkIt function. Added filtering of stolen alchemy reagents and solutions. Added filtering of stolen soulgems. Automatically place stolen treasure maps (and other trophies) on the ignore list. Added a setting for the "if value less than x" setting so that you can auto-junk them instead of just ignoring them. Added special handling to auto-junk spoiled food (which oddly enough is not considered to be "trash" by ESO). Rare ingredients and ingredient additives are now set to "Launder" even if you have the ingredients setting on something else. This allows separating out specifically the "Decorative Wax" and "Flour" ingredients that are used for furniture crafting. Whenever you are in an inventory page (simply looking at your inventory or at a vendor), auto-junking will be temporarily disabled. This allows you to remove items from the junk tab by unmarking them, and then doing a sell all junk or destroy all junk (as appropriate) on the remaining junk items. When the inventory page is closed, the auto-junker will automatically go back to its set mode. The next time some inventory change occurs to cause ThiefTools to rescan your inventory, the items that you unmarked as junk will automatically be put back into junk (unless you have changed the setting that caused that item to be considered junk). Added a "Junk" choice to the "Fence", "Launder", and "Ignore" choice lists. The "Junk" option will cause the item to automatically be placed in the Junk tab of your inventory. You can then examine the list and sell or destroy the contents of the junk list normally. Note, you can "Unmark as junk" an item that was placed in the list, but it will be put back at some time in the future (the next time that the backpack contents are scanned again) - so ALWAYS examine the contents of the junk list before you destroy it!! Automatically place stolen deprecated items on the junk list. Automatically place stolen trash items on the junk list. Added a setting to allow you to specify that if an item is a certain minimum quality, it will never be auto-junked, no matter what your other settings say. Originally implement to prevent auto-junking of Legendary items, it now allows you to set also Epic and Superior quality as well. Legendary is the default (and cannot be turned off). Added a toggle to enable/disable the "Prevent killing of innocents". When logging in (or reloadui), this is reset to whatever the ESO setting is. Added a toggle to enable/disable auto-stealing/pickpocketing while you are sneaking (and undetected). Auto-looting of stolen items is only turned on when you are sneaking when this is enabled. When you are not sneaking, then you can look in containers/NPCs without stealing from them. Made it possible for addon keybinds to be translated to other languages. Started using my utility library for functions shared between this addon and Where's My Guild Hall. Rewritten things as I've learned more Lua. Updated the Russian translation for the "not a thief" feature (previously from Google) thanks to ForgottenLight. Rewrote significant portions of the settings logic. You will have to reset your characters settings. The good news is that Thief Tools now provides the option of having account-wide settings - so you don't have to change things for every character you have. The "Display" settings which control size and location of the status bar are only account-wide settings. Every character will have the Thief Tools status bar displayed in the same location on the screen. The "Status Bar Display", "Filters", and "Warnings" settings can each either be account-wide or specific to the character. This means you can specialize any of these for a specific character and use the shared account-wide settings for all of your other characters. Fixed the Estimated Fence slots = 0 warning to only appear once in chat (until it stops being 0). Fixed the turning off the Estimated Fence slots = 0 warning by setting the slider to zero. Fixed the turning off the Free slots left warning by setting the slider to zero. Added the Russian translations for the new strings thanks to ForgottenLight. Fixed it so that when you deconstruct stolen gear, it is properly subtracted from your count of stolen goods. Added a new Warning Announcements setting section to allow you to set if you want to be told when your inventory is about to be full or if you have stolen enough for today's fencing quota. Added Russian translation thanks to ForgottenLight. Fixed the color problem with icons on the bar. Added ingredients to the list of items that you can filter on. Finally managed to find and fix the location of the bar problem that FWSWBN was having. Due to a change in the way that filter options are stored (to support localization) you may need to reselect your filter options in Settings. Added localization changes suggested by ForgottenLight. The filtering for lockpicks was broken because lockpicks do not correspond to the ITEMTYPE_LOCKPICK that Zenimax created but does not use. Had to set it so that lockpicks now match up with ITEMTYPE_TOOL. Added the option to have a fence reset timer on the status bar like Thief's Knapsack Extended has. The icon for Launders Left now disappears from the status bar when you turn off the Launders Left option. Increased icon sizes to make them easier to distinguish. Remove the anchoring options since they are not working as I expected them to. i can't use auto-steal ,it didnt work in my game, and status bar will hide forever after i played the game for a few minutes, i didnt use other Addons. For auto-steal, make sure that the ESO auto-looting while stealing is turned off as that will make ThiefTools autosteal have problems. With the status bar disappearing, it sounds as though the addon is erroring out. An addon that I recommend that you get is called "BugCatcher". Once it is installed, you can go to Settings, BugCatcher and see any bugs that any addons have thrown in the text box on the settings page. This information is very useful for addon authors to be able to track down problems. With BugCatcher installed, you can try to run ThiefTools again and see if BugCatcher catches any error messages. You can try typing /thieftools in the chat window to see if it responds, and if it does, do a /tt.stop followed by a /tt.start (also in chat) to try to restart the addon without having to do a lengthy /reloadui. This addon when used in conjunction with dustman (addon) to auto destroy white treasures has a chance to freeze the game. It may also occur with other stolen stuff being destroyed but I'm not sure. I'm assuming the addon gets triggerd for the new item being stolen and put in the bag, dustman moves it to junk and then destroys it... leaving this addon with a problem that sometimes freezes the game. Unfortunately its random, something like 1/50 chance of occurring on a destroy of stolen treasure. Took me a very long time to isolate the cause to this addon, so i'm not sure when it started, but i'm guessing/ it feels like it started with the latest major update as I've used this addon for nearly a year with dustman and had no issues. If trying to duplicate using dustman, the setting i'm using to destroy cheep stolen items marked as junk is in the destroy tab, with the "Threshold for stolen items" set to 42. The other way to destroy stolen treasures i'm not using - in the stolen tab you can set it to auto destroy treasures below a certain quality. - although I am using the Stolen tab to get dustman to mark all treasures as Junk. Must restart entire game after game freezes to recover. You are probably correct since both dustman and thief tools are attempting to move an item to junk. Thief tools does not delete items, but I can see a problem might occur if dustman destroys the item before thieftools can finish moving it to junk... This would imply that if you tell dustman to not destroy the items, then the problem would never occur. If you would test that out for me, I'll see what I can think of to do. - This last one might be an issue if it triggers the counting of white items within thief tools as dustman goes and flags and then deletes the item (with the setting in dustman of delete if less than 42). The reason I have thief tools set like this is so it will count white treasure items when i adjust dustmann to not delete them. As a debugging step I could set this to 45 and see what happens. - But i'm gone for the weekend so I can't do this until Sunday night. EDIT: I was thinking about this and if this IS the trigger it would explain why i'm only getting freezes on destroy of white treasures. They are about the only common item that is below the Dustman destroy threshold and intentionally above the threshold for thief tools to count as a stolen item! - I also have Thief tools set to ignore EVERY thing that it can be set to ignore in the filters section. I have autoloot for stealing set to on and dustman set to destroy most stolen items below the destroy threshold (42) .... so ALOT of destroying takes place. As part of my troubleshooting I have previously verified that if dustman does not delete white treasure items there are no issues. - well reasonably verified, as its impossible to fully verify, but i routinely set dustman to not delete low level treasures on days when i have limited time to steal things and there are no issues (set destroy threshold to 39). Last edited by Atola : 03/28/19 at 07:22 PM. Last edited by Atola : 03/27/19 at 08:18 PM. After last update addon doesnt work. There is no LibSFUtils in mod list therefore addon doesnt work. How can I fix it? You can either download and install LibSFUtils using Minion or directly from the web page (https://www.esoui.com/downloads/info...ibSFUtils.html) to install manually. This catalog is on my disk in addon catalog, but when I start the game, there is not this LibSFUtils in mod list in game. Why? Did you turn on the LibSFUtils "addon" in your character's (or account's) addon list? For account- wide, there is the Addons menu selection from the character selection screen; for specific character, the Addons menu option from the Esc menu. i disable all other addons and only thief tools active but addon interface disappear after like 2 seconds i cant fix this is this addon still works? So far as I know it still works. Try removing the saved variables file for ThiefTools (when you are not running ESO). Nevermind I found it. Someone should repair that bug because it's really frustrating to find a solution if you're new with addons's folder and files. I think i looked for a solution for 4 hours. The bug appeared after I clicked by mistake the "This character is not a thief" button, changing it back wasn't working. Last edited by oParis : 02/20/19 at 05:51 AM. 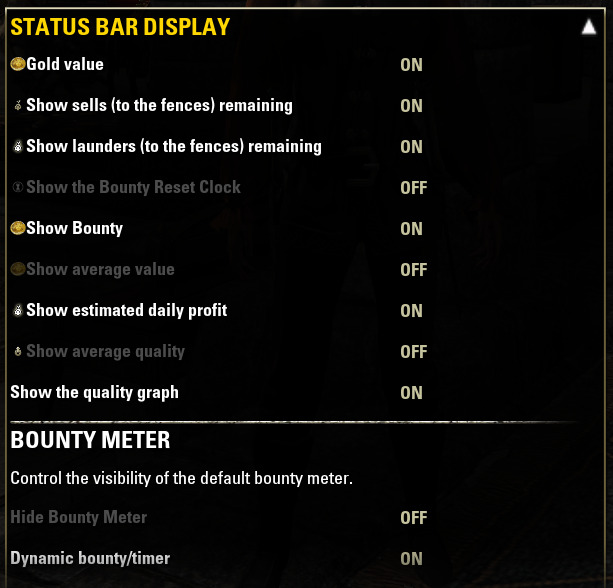 can we have an option to totally disable default bounty meter? as the current hide bounty meter settings still show the meter for i think 2 to 3 secs then it hide it self again. is it possible to add a bounty timer to this? On my thieving character I tend to get quite large bounties and have Swiftly forgotten to rank 4 but a timer for bounties would be great. Bounty time is already there. You might have to turn it on.